Okay, compared to the original, it doesn't hold water (sorry for the pun lol) but really, bringing it up to date, it was really well done. Yes, some things were a bit far fetched but what part of movies aren't nowadays. Take that away, The Rock did a great job as he has done in recent years, and honestly, it was very up to date with technology and such. I really enjoyed it. I give it a solid 4. How can people rate this a 4 or 5 its so full of BS . Usual format. Wife and kids in danger. Evil person. Big fire in big building. Yet it carried the thin plot fairly well and the 'effects were effective'. Good distraction movie. Takes your mind of reality. Cheers! Love this movie b st I have seen in a long time.plus haveing the Rock in it helped .lots of action. Loved the movie....lots of action. Some of the height scenes I had to close my eyes...too real for my taste. 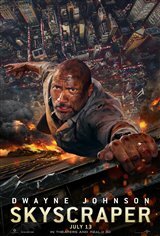 This is Tower Inferno meets Died Hard for sure - The Story & scenes are believable by the great special effects & Dwayne Johnson doesn't disappoint as well as Neve Campbell back on the scene - It keeps you rooting for the good guys to escape the disaster that is unfolding on the screen we are watching!